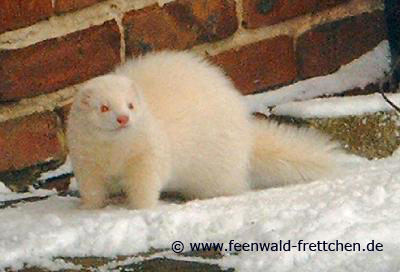 Fur: pure white to yellow fur, uniform coloring in the whole body without any spots. Undercoat and topcoat should have the same color. Clear separated badges at the legs, shoulders and tail, also the sable light has a slim dark line under his belly (so-called zipper). Black to deep brown topcoat uniformly about the whole back distributed, softy texture. The undercoat should be close and either from cream or white colour. The undercoat predominates, so the constitution is light. Must have a strong mask. 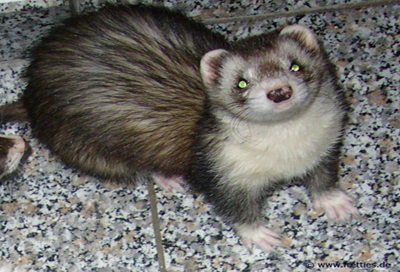 Fur: Clear separated badges at the legs, shoulders and tail. In opposition to sable light, the sable dark has no slim dark line under his belly or it is washed-out. Black to deep brown Topcoat steadily about the whole back distributed, softly texture. The topcoat predominates, so the constitution is dark. The untercoat should be close and from cream or white color. Must have a contrasty mask. 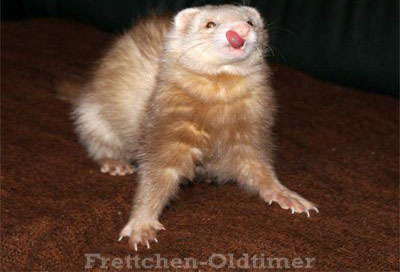 Fur: Pastel / caramel colors topcoat, steadily over the whole body distributed. Tail and Mask in the colours caramel, clearly stopped by the undercoat. 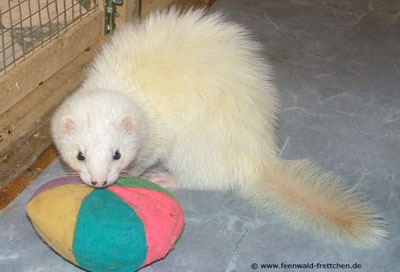 The undercoat can be steadily cream, beige or reddish coloring. 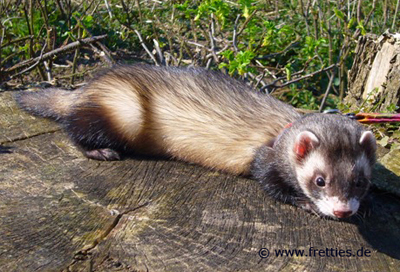 Fur: Chocolate (brown) topcoat, steadily over the whole body distributed. Mask is allowed but rich in constrast. The undercoat has to be beige coloring. 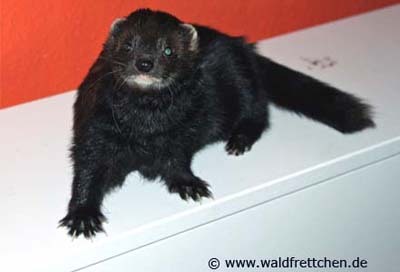 Fur: Types of colors for example sable-, cinnamon-, chocolate- or black-/dark harlequin. A large bib from chin downwards. All four paws must be white. Sickle hair may exist. “Blinker” (white spot at the knee) must exist. Butterfly under the belly is permitted, as well as points or lines on the head. The whole fur coloring, as well as the coloring of the nose, must be symmetrical. 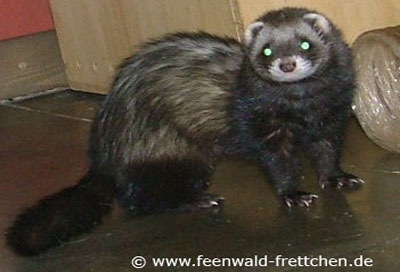 Remaining signs see for example sable / cinnamon ferret. Fur: Appearance like harlequin. 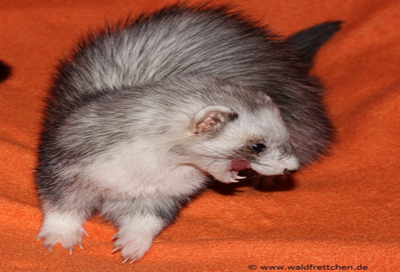 Cream-colored or white fur with dark grey silvery topcoat which covers the sides and legs. The feet, throat, belly and inside legs are brightly. Throaty spot goes on without separation to the belly. He may have a white tail point. The whole fur coloring, as well as the coloring of the nose, must be symmetrical. 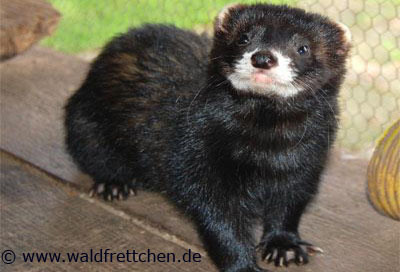 Fur: Brown or black undercoat, black topcoat. The topcoat is the deciding factor for the appearance. Black solid also is called "true black". Brown or grey undercoat, black topcoat. The topcoat is the deciding factor for the appearance. The Black Self has slight shadow behind the eyes. 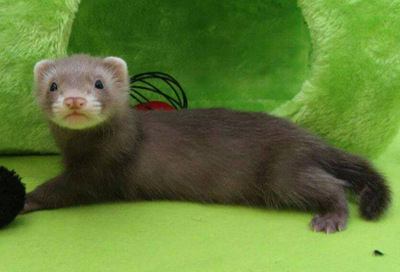 Here all bright and dark ferrets as well as silver, panda, black eyed white, dark eyed white, badger and other special colours are classified. 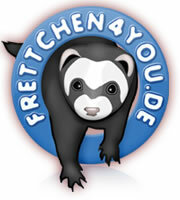 The whole fur coloring, as well as the coloring of the nose, ideally should be symmetrical.